SUNYEER Technology Co. (JMLED) has been pioneering to enhance LED design through latest technology. The key is to adopt COB (chips on board) approach to package light engine and well-equip with our many of patented mechanical structure design. That’s why our top quality LED products can keep longer lifespan no matter how harsh environment and how long time testing. Compared to others, JMLED remains high luminous performance and always keeps the same efficiency. Throughout the past years, JMLED has laid a solid foundation for its success in company management and widely extending its reputation in local & global markets. No matter how the world changing, as a local company we persistently stay focus on 100% “Made in Taiwan,” dedicated to perfectly fit light into our innovative technology to make sure our customers who apply our high quality, high endurance products will benefit both power and beauty of lighting. For industrial or street lighting fixtures, the height of installation is usually over couples of floors, which requires the highest stable quality with zero maintenance costs. This fundamental demand has driven JMLED to try its best to fulfill quality first requirement. That’s also the reason our products have been successfully controlled to minimize defect and light decay rate in order to support our customers with most reliable LEDs. 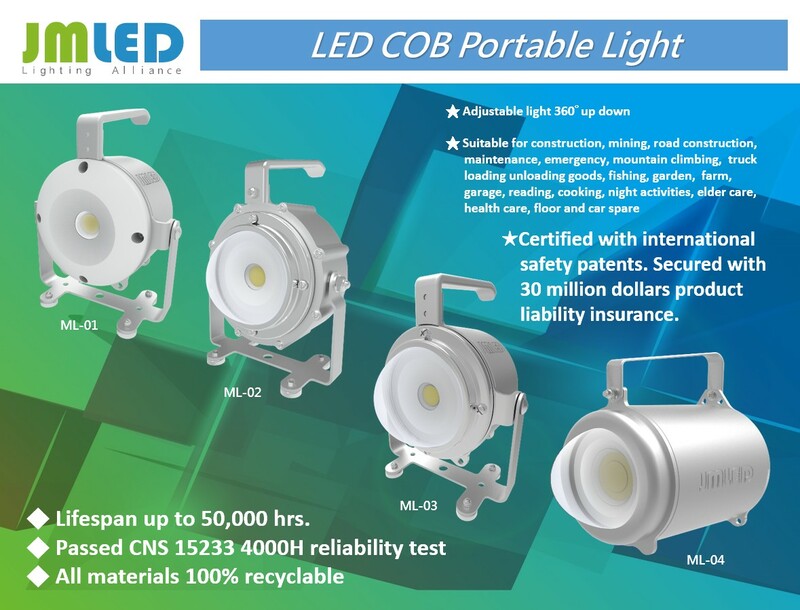 Other than developing high power COB LED for industrial lighting solutions, after our latest portable series (ML Series) for work lighting launched, these innovative products have well-received from lighting markets both locally and globally. The original idea for the product is designed to replace traditional work light suffering from neither short of brightness nor lack of power endurance. 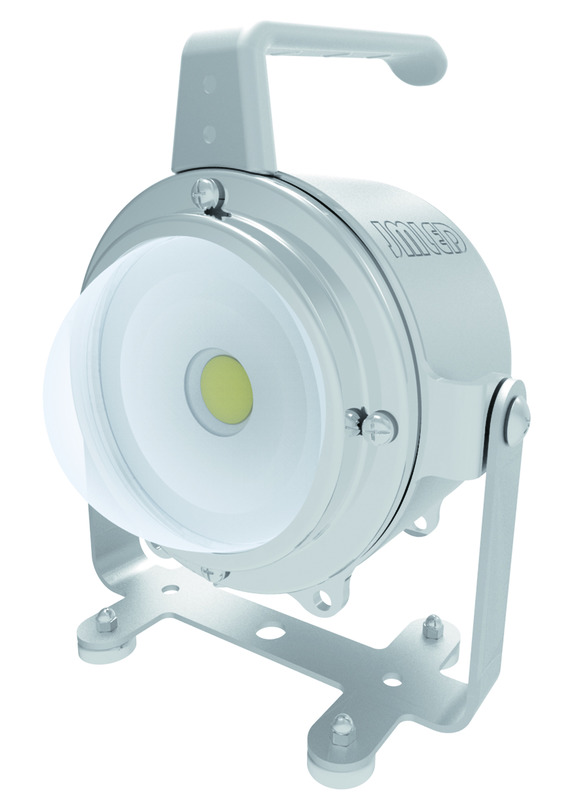 As a portable light, ML series are in small size and light weight with IP 65 for water and dust proof. More specifically, the portable light use two wattages switch types between 3W and 10W to adjust duration & brightness via one single control key for near or far distance lighting. On the one hand, while applying 10W, the duration of lighting can last 3 hours; on the other when switching to 3W that of lighting can last longer than 10 hours. Apart from its long-lasting, an interesting spotlight is the design of the powerful magnetic base which can be easily attach onto any mental surface for customers to change lighting angle. The last distinguishing feature is not only the whole product housing with stainless steel and aluminum alloy, but also as always comprising the craft spirit of JMLED designation in function and style. And this is our promise to customer without hesitancy.